The new programs TodayAgenda and BatteryStatus are very good. I configured TodayAgenda to a fixed screen height that just uses all the real estate. These are my notes on the T-Mobile MDA, which is T-Mobile's version of the HTC Wizard. I am new to the Windows Mobile platform, having used a Treo 270 followed by a Treo 600, although I used Windows CE units before that. So these notes may be helpful especially to people new to Windows Mobile 5. The descriptions should work for Cingular 8125, Imate K-Jam, Qtek 9100 and other GSM incarnations of the HTC Wizard. This is not exactly a review, because it needs to serve the role of reminding me of my configuration. It also serves the role of reducing the personal help I will have to give others who adopt the device on my recommendation. Coming from the Treo, I was used to one-handed operation. I have mostly achieved that on the MDA, and much of my customization efforts were devoted to doing normal things one handed, and without having to look too much. My first reaction is that the MDA is a terrible phone -- it is nearly impossible to dial a number and literally impossible to do so one-handed straight out of the box. But after a substantial amount of customization, I can do all my common tasks one-handed and the phone unit seems better than the Treo: better sound and better reception. The one-handed problem is essentially fixed with remapped buttons and voice commands. I actually like it better than the Treo for the things I did in the car, because I can do almost all of them by clicking one hardware button and speaking a command. Most pundits prefer MS Voice Command, but the program that came with WM5 has worked fine for me so far. I learned most things from Howard Forum and XDA Developers. This article was especially helpful at convincing me to give up on the Treo. It is pretty clear to me that Handspring has given up on Palm, an action which is nearly suicide for them, because it isn't like they are a high quality device company (witness the problems on the 650, for example). So the question for me was not really if I would switch, but when. That article got me to switch now, rather than wait for the next device with my creaky Treo 600. I quit missing the Treo, and started thinking "This is an improvement," around day 3. Physically, the device seems solid, although not as solid as a metal Treo. The sliding hinge seems fine to me, but I am pretty gentle with my devices and my Treo 600 was still working last week after nearly 30 months. The buttons have a solid feel and the keyboard is wonderful for this form factor. I like to travel overnight without a laptop, but this sometimes entails writing substantial emails and that is much more feasible than on the Treo. The keyboard action is good, and the backlighting is spectacular. I traveled with the Treo, this is much better overall. The small stylus is a challenge, and a bit hard to pull out of the MDA. I used the stylus pretty often with the Treo, typing with the stylus in my fingers to fix typos and so on. I suspect that I won't use it as often on the MDA. I like the shape a lot. The Treo seemed too wide somehow. The MDA feels more phone-like and the thickness isn't a problem to me. The camera stinks. I don't know why HTC bothered with a flash; it uses battery and doesn't work beyond perhaps a foot. Daylight pictures are OK but it is definitely an emergency camera. The screen isn't as bright as the Treo. The Treo doubled as a flashlight in a pinch -- I'm not making this up, I found my keys under movie theater seats with it -- but the MDA won't serve this particular role nearly as well. Of course, with a black theme, it is even less bright. Daylight use is marginal and requires a close look at the screen, or voice control. I bought a 2GB A-Data miniSD card from newegg.com for $91. So far it works fine. Still, I copied a GB of music onto the MDA and have used it without problems, as well as copying family pictures, programs, etc. A great thing about WM5, relative to Palm OS, is that my 2GB memory card is real memory that I can install programs on. That is a great thing, but occasionally the memory card gets disconnected. This has a simple cure -- pop it in and out again -- unless something tried to write to it while it was unavailable. In that case, Windows Mobile creates a folder called Storage Card in main memory. Then, when you put the card in, it is named Storage Card2 and its programs are unavailable. The cure for this is to not have programs write to the storage card automatically, unless they are run from the storage card in the first place so that they can only run when the storage card is working. The two big offenders are storing email attachments on the card, and IE cache on the card. I would recommend resisting both of these, although people with tons of emails will need the space offered by a storage card. If you find yourself with Storage Card2, copy anything in Storage Card to the relevant place on Storage Card2, then remove the card, delete the Storage Card folder, reinsert the card and you are good to go. I used MemMaid to reduce the IE cache to 4MB. I put the Boxwave Cleartouch antiglare screen protector on my unit, but I switched the Crystal unit -- the antiglare makes it harder to read in sunlight in spite of the anti-glare, and fingerprints are more obvious than advertised. I got the MDA to find and connect to the two wireless routers I use (Linksys and D-Link brands) without significant difficulty; this was intuitive and, to be fair, easier than configuring Windows for the desktop. One of my routers doesn't broadcast the SSID and I still had no trouble. Activesync 4.1 worked fine, except that it wouldn't synchronize Outlook Notes. The Notes folder icon appeared in the settings in Activesync, but the box that one would check to synchronize is missing, not greyed out, but missing. When I installed Activesync on the office PC, the exact same thing happened. There is a note at MS suggesting that the problem lies in a corrupted note. I tried deleting all the notes, which didn't fix the problem, nor did I expect it to. The suggested remedy also involves reinstalling activesync, but that didn't work either. What did work was to eliminate the notes, uninstall activesync, hard reset the MDA, and and start over. A painful solution. Activesync has created continuing headaches. I sync with the USB cable at work and with Bluetooth at ome. The Activesync fails to find a connection. The problem seems to be when the PC goes to sleep. I was having to shut down and restart both the PC and the MDA to obtain a connection. This is especially severe on the bluetooth connection. A workaround is (i) on the MDA, go into bluetooth settings, open the PC listing and uncheck and then recheck the ActiveSync service, and (ii) shut down Active Sync and restart it on the PC, using ActiveSyncToggle. This program also solves the problem that activesync would start and then report that it couldn't find the bluetooth dongle for the idiotic reason that ActiveSync started before the bluetooth dongle was plugged in, because I can start the PC with ActiveSync turned off. ActiveSync doesn't have an Exit, and ActiveSyncToggle provides it. I eventually gave up and only use the USB cable and everything works fine. This is annoying because the main virtue of bluetooth, for me, was synching without connecting the PC. Configuring email was not so intuitive because T-Mobile has created an annoyingly "handy" utility that assumes you want to connect to a T-Mobile email server and getting around it, so that you can configure POP3, isn't obvious. Moreover, it sends you a series of email saying "bad configuration" from the T-Mobile server. 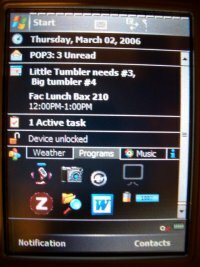 The key was to cancel the T-Mobile configuration and then just continue with the setup, where a Pop3 account can be created. After that, everything was standard. There are few email deletion options; MS pretty much wants you to delete email immediately or never. I like to be able to remove mail I don't need to see again from the server from the MDA, so that it never reaches my PC. Thus, I like a "remove from server on deletion" option. There is the possibility of removing from the server when deleted from deleted files, which mirrors PC Outlook, but then you must manually empty the deleted files, which is a nuisance. Snappermail on the Treo was a better mail program. Moreover, by force the Pop3 mail account is different than the one that synchs with PC Outlook. This means I usually have two copies of each email -- one downloaded directly from the internet, and one synched through the PC. The good thing is that the synched ones go away when deleted from the PC inbox, but the bad thing is that they go to the deleted emails folder, where they sit until I remember to delete them. There is a "delete when disconnected" option, but that doesn't seem to do anything. You can also have "delete immediately," but that is too draconian and unforgiving. I want to move it to the deleted items folder, but have at least five minutes -- until I close the program, say -- to change my mind. No such luck. I had looked forward to using bluetooth to synch at home. That way I can plug the MDA into a wall charger and not have to have a USB cable connected to my laptop. I find it annoying having a USB cable connected to the laptop because it is inflexible and gets twisted over time with the power cable. I bought an Airnet USB bluetooth key ($1 after the $15 discount at newegg.com) for my laptop (an IBM X31). The MDA does bluetooth great. The PC doesn't. Every time the PC goes to sleep, it loses the blue tooth connection and is unable to recover it without a complete shutdown and restart. I don't think it is a problem with the bluetooth USB key but with the windows bluetooth manager. Following my usual practice, I tried using the device without using the manufacturer's software. I rarely like such software because I run a lean PC (thanks to blackviper Warning: PDF) and these programs are memory hogs. But with the bluetooth connection failing whenever I put the laptop in sleep mode, I even tried the Airnet bluetooth manager, which has about ten different programs that control ten different functions (bluetooth music, TV control...). Having gone through the pain of the installation and configuration, I was unable to get bluetooth synchronization to even work, although that could be a conflict between my firewall and the Airnet bluetooth manager program. In any case, I uninstalled the Airnet manager and have to restart my PC to use the bluetooth connection. As noted above, I eventually gave up. Bluetooth is quirky to set up in the first place. Here is an adaptation of this thread to the MDA. On your PC go to the Control Panel and select "Bluetooth". (You can just double-click on the bluetooth icon in the tray as well.) In the "Options" tab, make sure all the ticks are on. Your PC should also be ready to be found as long as you ticked the fist box in the step above. On your MDA, Go to Start, Settings, Connections (Tab), Bluetooth Settings. On the next screen select find device. You will now be taken to the partnership screen, where you just follow the instructions to add your PC. Follow instructions (creating a shared passcode) until you hit finish. Now deselect the checkboxes that permitted finding the device on the Mode screen. Under the devices tab, you should see your PC. Press and hold the PC, and you will get a "services" choice. If Activesync is there, you are done. Otherwise choose 'add service' and Activesync is added automatically. Insure that the box is checked. Close everything down until you're back at the today screen. Back to your PC, double click on the Bluetooth icon in your system tray. Go to "Com Ports" (Tab) and click "Add". Choose incoming. An incoming port is added to the list. It may already be there, in which case you don't need to add it. It should look like "COM X Incoming." Remember what number is after COM. Close all windows, making sure you hit OK or Apply where you have to. Open Active Sync on your PC. Hit File, Connection Settings. Enable the first tick, and select the COM port you had to remember in the previous step. Hit OK.
Open Active Sync on your MDA. Choose Tools, Connect Via Bluetooth. Software doesn't uninstall very well. This is a problem with Windows XP, but also with the MDA. Something I installed made my system take 150 seconds to boot and to generally operate slowly. Unfortunately, I tested a lot of software so I don't know what it was; it was not any of the programs below unless I misconfigured one of them and got it right the second time. The cure in the end was to hard reset and start over. I added the programs sequentially, reseting and checking the boot times. With no added software other than the T-Mobile stock, boot took 63 seconds; it is now 80 seconds after adding all of this software. Usually after running the uninstall program (in Settings), I have to (i) delete the program's folder from \Program Files, (ii) delete installed components from \Windows when I can identify them because they have the same name (e.g. NewsBreakWakeUp.exe), (iii) delete the quick launch icon from the \Windows\Start Menu\ folder, and finally (iv) delete any notifications using MemMaid. Just what is it that Uninstall Programs does? My strategy is to figure out what I like on the device, keep careful track of settings and installations, then do a hard reset and re-install everything from scratch so that there isn't a bunch of junk in the registry from improperly un-installed programs. I've since taken to backing up using SPB backup, installing a program, seeing if I like it, and if I don't, just doing a hard reset and restore. This software fulfills several helpful functions, first of all it adds a today plugin that allows you to add shortcuts to programs. This is very nice because you can use the 4-way joystick control to page down to the programs and select them. Overall, this takes too much attention for use while driving, but is nice in other circumstances. 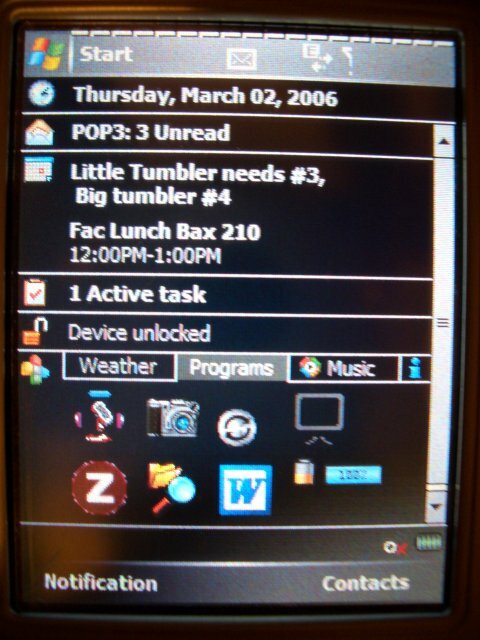 You can resize the icons by 'tap and hold,' which is the Windows Mobile equivalent of a right click. An important thing is that Pocket Plus does is make the X button on the device actually close a program. This is a really bizarre thing -- the X button in the upper right corner minimizes rather than closes programs, which means that you can slow the already marginally sluggish device to a crawl inadvertantly. This is quite valuable. Pocket Plus adds an unobtrusive battery meter to the top of your device and adds several new button functions that you can then map to any button. This is critical because it lets me map the IE key to Voice Control. I don't use IE all that often and in any case when I do I tend to have the stylus out. Consequently, this is a really easy way to create an automatic voice control launcher which is terrific in the car, at least when I don't have the top down. Pocket Plus is available here. One thing: immediately remove the backlight indicator from the today screen. It turns off the backlight at random and you have to shine a bright light on it to turn it back on. The first time it happened I thought the device had broken. UPDATE: I have taken SPB Pocket plus off the machine; the overhead cost is too high. It is slow and the functionality isn't good enough to be worth the overhead. At the same time, I bought the Spb Weather. This puts weather information on the Today screen (=Desktop), which I like a lot. It updates periodically (I have it set for 2 hours) and has simple graphics, supports multiple cities. Worth it to me. A major annoyance is that it apparently won't update through the web, only when connected to activesync. This doesn't really make sense on the device, especially because I want weather reports mostly when I travel, but that is when I am least likely to have a connected PC. So really, this is less of a program than meets the eye. UPDATE: This problem is fixed; SPB Weather now updates wirelessly. UPDATE: This program cost me over $350 -- that is as much as the phone cost -- downloading weather data every two hours while I was traveling in Europe, where data costs $15/MB. It was downloading 1.5MB every day! Why does it need 24K for each city! Of course, I was stupid not to turn it off, but it had never occurred to me that it needed more than half a K to download high, low temperatures and the rain/shine/sleet/snow/gloom of night forecast. Spb Pocket Plus lets one change the look of the Today screen, but I very much prefer the black theme provided by this thread. Generally the MDA is harder to read in direct sunlight than the Treo 600, but the black theme helps slightly. I like the clean look and it make sthe icons and weather program looks terrific. Smartskey (registration required to see program), a free program, is essential. It does two main things for you. First, like Pocket Plus, it lets you close programs (rather than minimize) with the X in the corner. But more importantly, it lets you map "press and hold" of the lower left key to open the start menu, and press and hold of the lower right key to activate the OK/Close feature. It permits exceptions as well, so that if you don't want to close contacts and calendar, for instance, you can make these minimize when you hold down the key. To do this you use the program's name for itself in the title bar, not the prog.exe name, so that Pocket Informant is Informant 2005, and Windows Media Player is Windows Media, not wmplayer. It is pretty important to set defaults for closing to the most useful setting -- either close or minimize. With calendar, email, and contacts, I have them set to minimize rather than close. With media player, it closes at the X, but minimizes at the right soft button. Big frequently accessed programs like calendar should be minimized because otherwise there is an appreciable and annoying lag getting to them. While I'm here, I found creating a shortcut very mysterious. The key to creating shortcuts is to do them when you are synchronized to the PC. Use Activesync to navigate to the program files (/Windows/Start Menu/Programs/), copy the short cut, navigate up one level to /Windows/Start Menu/ and paste. This puts shortcuts on the Start menu. If you want them somewhere else, navigate there and paste. You can also bring them up to Windows, edit them (open notepad and then use it to open the link), and then paste back into the relevant folder. Every thread tells you to point and hold to bring up a menu allowing you to copy the program, and that has rarely worked for me. Smartskey will also automate the process of overclocking. Registry Wizard is an incredible free program. You have to register at the site to download it. It is terrific! It lets you increase caches, shut off animations, and generally reconfigure to make the MDA run faster. While you are there, you can also overclock your PPC. Smartskey lets you automate the process of overclocking, but instead I created a shortcut on the start menu that lets me overclock it when I need the power, and not otherwise. Mostly I've found it satisfactory in speed, but it is positively zippy at 240MHz. Even at 216MHz, it is noticeably faster. I had a miserable experience with Windows CE. It was always crashing and losing my data, and backup originally meant using a PC to restore it. Later units which took a PCMCIA card could be backed up, which all of a sudden meant I could do email on the road with a handheld device, and restoring was a common part of this. Not surprisingly, this experience made me more paranoid about backup than most. After some dithering, I selected Sprite Backup but I haven't tested it yet. It can back up to both the PC and the miniSD card, but I ran into trouble backing up to the PC right away. The problem seems to be that I synchronize with two different PCs (office and home) and this seems to give Sprite conniptions, complaining that the MDA had been synchronized when Sprite was turned off. I uninstalled Sprite (it has a 30 day money back guarantee) and installed Spb Backup, which I'm still testing. It only works on the PC card, but that is how Sprite worked for me too. After version 1.1.1 came out, it started working right and now I'm happy with SPB. It is nice to see the current state of the backup in the Today screen. UPDATE: Don't run SPB backup from the SD card. It won't work. Otherwise it works great. 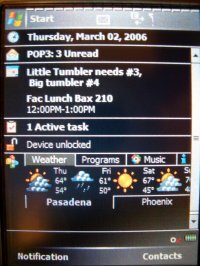 The basic contact list and calendar seemed kind of difficult to use to me coming from Palm, and not very attractive, so I bought Pocket Informant. 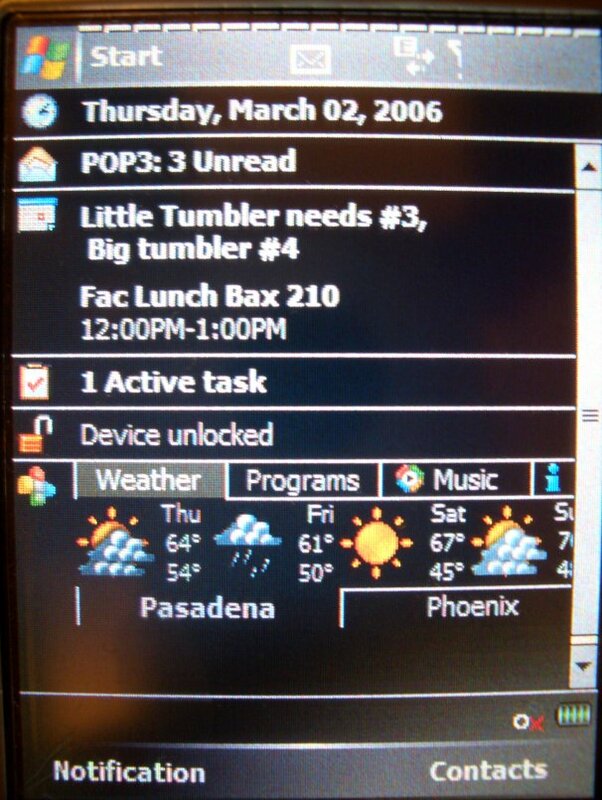 This program is still a good bit harder to use compared to Palm -- just try to put a quick entry into the calendar, you don't touch the hour and start typing, but instead have to use menus to start an edit mode -- but Pocket Informant looks nice and offers a lot of functionality. The other thing I dislike about calendar is that I often want to click on a day in month view and be transported there, but instead you have to click and hold and then select day view from the long menu that arises, and to click on an hour and have it automatically add an appointment. Well, it turns out that Pocket Informant is the reason that clicking on an hour doesn't automatically bring you to the edit screen, and I have replaced PI with the Diary plug-in to SPB Today Plus, which lets one see an entire week on the today screen, add and delete appointments, etc. I am so far happier with this arrangement. UPDATE: Now I got rid of both of PI and Diary. These are bloated programs that noticeably slow down the device. Instead, I am using Scott's Launcher and TodayAgenda which are small, fast and work great. Mortsaver allows you to turn off the device screen and lock all of the buttons but still have programs run in the background. I only use this for listening to MP3s, but since windows media player keeps the screen a bright blue, it is nice to be able to shut it off. (The free media player with the Treo 600 had this functionality built-in.) Music sounds better on the MDA, however, even using the stock headphones with the MDA. Ilium SOftware's Newsbreak is an RSS feed program that works pretty well. A very nice feature is that you can put in your own site by http address, which I found easy to look up on the sites I liked. Engadget has a terrific RSS feed, with ideally sized stories, and Slashdot is a useful feed, too. The competition is Egress, which I didn't try. Newsbreak works fine with the entire thing installed on the miniSD card, and doesn't even need to be reinstalled after a hard reset. Ilium SOftware's Listpro is a somewhat more difficult to use list program. Palm users are addicted to Handyshopper; this is more powerful and not as good. This is a major WM5 theme -- more options make it more difficult to do normal things. However, there is one huge advantage of this program, which is desktop synchronization. This adds $10 but actually makes the program more useful since you can do elaborate configurations on your PC. Listpro works fine with the entire thing installed on the miniSD card, and doesn't even need to be reinstalled after a hard reset. Metro is freeware that gives metro directions for an impressive list of cities. I looked at London and Paris and it seems to do a very good job. It installs on the mini SD card. MemMaid is a $15 application that lets you see and delete errant notifications, free up memory, see all running programs, and other conveniences. Overall it isn't very good value but the ability to find and delete notifications from programs that I uninstalled makes it worth the purchase price. This Engineering Calculator is fine and free scientific calculator. The only problem with it is that it shows an advertisement for the other programs before launching. I would gladly pay $10 to eliminate this feature. Zagat To Go is a list of restaurant recommendations and reviews. It isn't nearly as useful as Vindigo and I will switch as soon as Vindigo is available. But in the meantime, it seems to be the best thing available. It installs on the SD card. 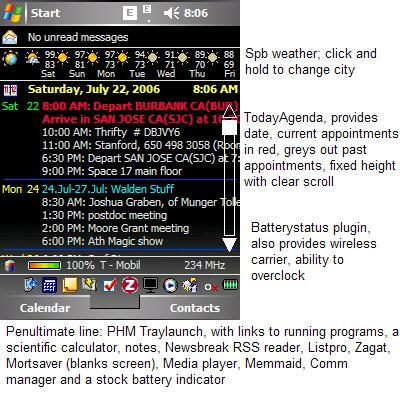 Phm Traylink is an excerpt of a larger free program that puts icons in the bottom of the today screen, where allegedly running programs appear (for me, only network connections and Pocket Informant appear there) from which the programs can be run. Since this is wasted space on the Today screen, it is marginally useful. It is much more useful, I suppose, if you don't use SPB Today Plus, which puts larger icons on the Today screen. Over time, I am finding this much more useful -- the key is to put programs there that one needs the stylus for anyway, like notes, file explorer, listpro, and zagat, but now I've replaced it with Scott's Launcher. Here is a free program I downloaded but haven't installed. TCPMP: The Core Pocket Media Player is a feature rich media player that I use for mp3 and video playback. It allows you to play video encoded with the popular divx format which windows media player does not. Available here. I've also had recommendations for the free Green Audio Player, but haven't yet tried it. I installed Total Commander, a file explorer that gives you access to your registry for editing. The second biggest idiocy of the device is the fact that the software keyboard pops up at inopportune times. There are some programs where it seems to pop up only if physical keyboard is open. There is a program, Null Keyboard that is supposed to solve the problem by making the software keyboard one pixel square and hence invisible, but like many others on the boards, I can't get this to work. No other keyboard is selectable, including the three or four others that come with Windows Mobile. This is probably a T-Mobile software flaw, but no one seems to know. I had a catastrophic failure (wouldn't wake up from a backup), did a hard reset, and none of my backups worked. I think this is because I was running SPB backup from the SD card. Phooey. Good thing: even when the backup fails, you can recover documents and PIM data from SPB backup, just not the programs and system settings. 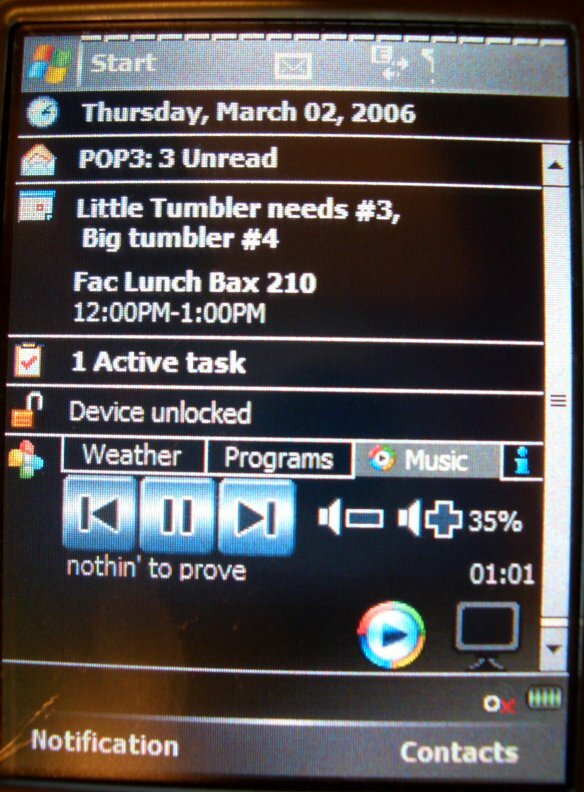 So I rebuilt the system, and used this as an opportunity to install xelecin's ROM, 2.24 with only part of the T-Mobile customization. This is great, it is much faster, and the radio works much better. I hard reset my device to clean up uninstalled programs. It sped up considerably when I did this. Here are my notes. it's really an exercise in gymnastics resetting these things. Hold the device facing you, depress simultaneously the voice command and WiFi (connectivity) button. One is on the right side of the device and the other is on the left side of the device. With your other hand and the stylus, press the reset and release immediately. Remove the stylus and continue holding the two buttons until onscreen instructions appear. You will need to then press the SEND key [green phone button] (as the instructions indicate) to do a hard reset. the secret to the hard-reset is to just barely press the reset button. if you hold it down for more than a split-second, you will do a regular reset. hold down both buttons (as listed above), and VERY quickly tap the reset button with the stylus tip. re-installed activesync. Note you will be stuck with the name you pick as the device name, folder name, etc. Connected through USB, local area connection appears, told zone alarm to put in trusted area. Added notes (wasn't checked) and it appears on list. In the main window, click on the "Program Control" tab in the left pane. Navigate to the Microsoft ActiveSync installation folder (C:\Program Files\Microsoft ActiveSync\ if installed in C drive with default settings) and select the WCESMgr file. Click Open. You will notice a new application has been added to the Program Control list. Please set the following by clicking on the corresponding box and selecting the value listed as shown. In the Main window, click on the "Firewall" tab in the left pane. Click on the "Expert" tab in the main window. In the Expert Rules screen, click Add. In the "Add Rule" pop-up window, provide a name for the rule in the "Name" field. Navigate to "Add Protocol" menu item as shown. Click on OK until you navigate back to the main screen.